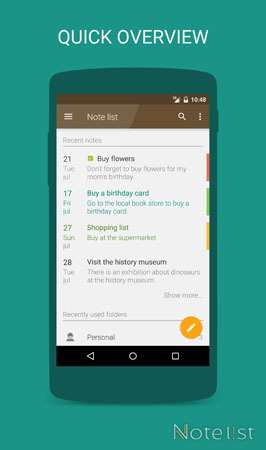 Note list allows you to backup and synchronize your notes automatically to your Google Drive™ account. If you have multiple Android devices you can also use the synchronization function to keep your list of notes synchronized between your devices. Note list can also be used in an offline mode. Whether or not, your notes are always also stored locally on your device. This way you can view, edit or create new notes when you don't have access to an internet connection. Your changes will be synchronized again when you go online. Setting up the synchronization option is an easy process. Just open the settings page in Note list and select the enable synchronization option and follow the instructions on screen. In case you rather or also want to have a local copy of your notes you can use the backup manager build in the app. The backup manager allows you to create a local backup of your notes and folders which you can then transfer to a pc for save keeping. You can create a manual backup at any moment and the backup manager displays a list of backups made with Note list stored locally.